For most B2B companies content marketing is not a new concept anymore. A study run by the Content Marketing Institute in 2018 finds that 91% of all marketers working in B2B use content marketing to reach out to their prospects and customers. While the number of those committed to content marketing is high, the number of those following a strategic approach is not: only slightly more than a third of those who engage in content marketing document the process and track numbers and statistics. This shows that there is obviously a gap between doing content marketing and following a strategy in doing so. But how do you start being a strategic content marketer? Which KPIs (Key Performance Indicators) are meaningful and should be measured, and how can content be used to guide prospects through the different steps of the customer journey? These are some of the questions we will focus on in this article. Before starting to work on a content strategy, it’s essential to define the goals you want to achieve with your content marketing. While some strategies focus mainly on lead generation and acquiring new contacts, other strategies aim to improve customer service or the company reputation. To make sure you are following the goals that go hand in hand with the company’s business strategy, it’s recommended to cooperate with other teams already at this early point. Setting goals is crucial, because they're the bases for any content you are going to create. Content that aims to generate new leads, for example, is completely different from content that helps to increase brand awareness. Once your goals are set and defined you can move on to the next step. With the increasing use of technology in marketing, the amount of available data and statistics is also growing and there seems to be an endless variety of KPIs one can follow up on. So, what is a good approach to finding out which KPIs are meaningful for your content marketing? A good start is knowing the difference between trivial and meaningful numbers. Trivial numbers are, for example, the amount of Facebook fans or the page views of a blog article. They are trivial in the sense that they show how many persons you might be able to reach, but they don’t say anything about the perception of your content – for example, whether someone has actually read your Facebook post or blog article or not. KPIs showing the level of interaction are more meaningful when evaluating the effectiveness of your content marketing. They show if people really engaged with your content and thus are a better indicator for the grade of perception. In case of a Facebook post the number of likes or comments would be indicators for the level of interaction, for a blog article social shares or comments. However, it’s not only perception that counts: if you really want to evaluate the monetary worth of your content marketing, you will have to start measuring the ROI (return on investment) of the different marketing channels. KPIs like generated leads, sales and cost per interaction are the ones to follow up on. With the help of the right tools, activities in different channels can be easily measured. Website and SEO metrics can be tracked with tools like Google Analytics, MOZ or Searchmetrics. Media monitoring tools like LianaMonitor help you follow discussions on social media channels and provide handy reports about your social media visibility. Social media metrics can be followed up on in the platforms, as Twitter, Facebook and YouTube all offer extensive details on user behaviour. Google Analytics delivers extensive insights into your website statistics. In addition to these tools, classic methods such as customer surveys help you paint a picture about how your company and its services are being perceived. A good way of getting to know your customers better is the development of so-called Buyer Personas. But what is a Buyer Persona? A Buyer Persona is a fictitious person representing the typical customer. Having Buyer Personas helps understand your customers’ needs and challenges better. They are also considered useful when adapting content to actual customer needs. What is a typical job title? Which challenges is the person facing? How can we help overcome those challenges? Based on this you should be able to develop two to three different Buyer Personas. 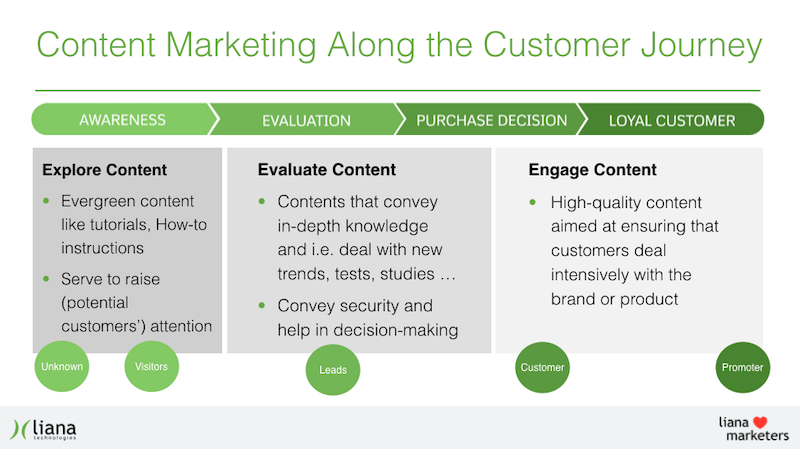 Different types of content have different goals, and mapping out your content to phases of the customer journey will give you an idea about the different types of content you could and should create. Explore content is typically found in blog articles and posts on social media, such as how-to instructions or short tutorials. Evaluate content is more detailed and conveys in-depth knowledge, as in guides, whitepapers, courses or webinars. Engage content is content designed to ensure that customers are intensively involved with a brand or product. This typically includes surveys and feedback questionnaires, video tutorials and customer webinars. Following your customers on their journey and delivering the right content at the right stage is one of the main prerequisites of successful strategic content marketing. The base for your strategic content marketing is now set. But how should you organize the process of creating content in your daily work? Depending on the size of your team, the amount of produced content and company structure, a simple Excel sheet can be enough – or you start using an editorial or project management tool. How to create a content calendar? Now that your content marketing strategy is set, you can start implementing it. Following a strategic approach in content marketing requires some effort, but it's definitely worth it. Once the strategy is set, it will benefit your company and you'll have a clearer structure what you're doing and why. Remember that marketing strategies are never set in stone – adjust your KPIs and content according to what works best for your customer group, and keep on developing and refining your strategy. For more tips and tricks on how to develop your digital marketing, susbcribe to our Digital Marketer’s Newsletter.